Art and revolution have a fascinating history of parallel development, fusion, and conflict. Art can be a means of activism and propaganda, liberation and dissent. Its emergence in a totalitarian state can be an excuse to crush protest, just as it can be an incitement to revolution. It can also be a medium for people to witness atrocity as well as freedom, and then to remember political events that have lingering, even haunting, cultural significance. In some circumstances, revolution itself can provide a fertile environment from which artistic movements may spring forth; in other situations, the upheaval of a bloody civil war may kill, injure and traumatise the very people who would paint an innovative future. In Cairo, in recent months and years, these various triumphs and difficulties have all emerged in a constantly changing political and artistic environment. Art has been a symbol of victorious freedom, as well as a tool to fight for it. It has also been a dream stifled for many, as bloody massacres and raids make living precarious, let alone painting and writing. One young artist and writer who has lived through these tumultuous times is Marie-Jeanne Berger, whose paintings and textiles recount figures and events of the past few years with boldness and wit. Reminiscent of German expressionism as well as drawing upon Islamic art history and practises, her work is playful as well as defiant, politically bold and determined. Your recent paintings have a decidedly political influence. Tell us a little more about the events you have witnessed in Cairo lately, and how those experiences have directly (and indirectly) affected your art practise? Marie-Jeanne Berger: It’s difficult to encapsulate the kinds of experiences I’ve had in Cairo over the past few years, but briefly—I’ve been living in the heart of the city, near Tahrir Square. Living in such close proximity to many of the events that have rocked the country, and being witness to many of them—clashes, demonstrations and the slow encroachment of public spaces—these things have had an enormous effect on me and the rest of Egypt. Especially witnessing how violence and uncertainty can change a community. My way of expressing my reactions to these events is by making things. 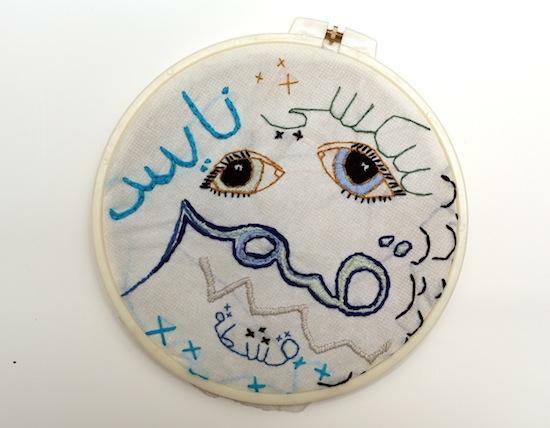 'Night Terrors,' for example, was made after witnessing the clashes on Mohammed Mahmoud Street, where protestors held street battles with police officers in front of the Ministry of Interior. Yet the real impetus for the painting was more personal: returning home from these battles, when the people in my building would attack me, sometimes physically, assuming I was a spy or an instigator. This is how a climate of fear permeates daily life. For that reason the specificity of the work is really located in its depiction of fear more than anything else. I exhibited the work at a Sudanese gallery, and many of the viewers from Darfur, Blue Nile, Nuba Mountains and Abeii really identified with it, in terms of their own experiences of war. As a side note, state security officials approached my mother in the street, and told her that they did not approve of the painting, and that they had not killed anyone. Naturally, when they viewed it, they saw themselves as the perpetrators. I was upset that these officials didn’t comment on the painting as an art object. MJB: The 2011 Uprising, or the Revolution, created a new space for young, politically aware artists: the street. As the political became public, Egyptians congregated in squares and streets across the country. Visual artists bravely utilized the walls that would overlook these spaces as large canvases to express their views. These artists were using graffiti to have a conversation, to critique, to condemn. And these spaces, unlike the traditional galleries and museums of Egypt, also reflected the temporality of events happening in the street. It was a running narrative. At any moment, the walls would be a collage of images of martyrs who had died in different clashes, political caricatures, Qur’anic excerpts, Pharaonic allegorical illustrations of current events, criticisms of sexual harassment. Things that wouldn’t be said anywhere else were publicly broadcasted with the graffiti. And then the wall would be whitewashed, someone would paint over it, and the street would change. Unlike the cloistered Egyptian art establishment, the streets were free, and young artists could access them. A broad audience would see their work. Performers, musicians and writers followed, capitalizing on these public gatherings to stage happenings. The past years have seen a dramatic increase in the number of small exhibition spaces opening around the city, allowing a platform for a greater population of young artists to show their work. Unfortunately for the larger art institutions, general instability and the political atmosphere has made it much harder to sustain a schedule of exhibitions and events. Under President Morsi, for example, Cairo Opera House performers and musicians went on strike because he appointed a minister of Culture that fired the head of the Opera House. Politicians also questioned the appropriateness of ballet. Curfews, roadblocks, violence and traffic also contribute to a dearth of performances, as well as audience members. There is a humorous aspect to your work as well: how do you explain the place of comedy, or political satire, in society when it comes to revolution and conflict? MJB: Humour is a deflective response to difficult subject matter. While some might consider the humour of my work to dilute its political impact, I would counter that, suggesting that humour often intensifies a person’s emotional response to an image or an idea, by arousing a complex jumble of reactions that then need to be disentangled and identified. Egyptians generally make jokes about everything, but for politics, this is still relatively new territory. For example, while President Morsi was constantly being made fun of, it is unlikely commentators will take the same liberties with the army, or General Abdel Fatah al-Sisi. Political discussion has only really emerged since the ouster of Mubarak and the establishment of meaningful elections. As a foreigner, I also think: who am I to engage in this discussion? Perhaps this is also why I prefer to engage viewers with funny images. Funny reserves judgement, and isn’t proscriptive. What about the role of art more generally? MJB: In this important political moment in Egypt, art is playing the vital role of mediating and examining a mix of viewpoints and emotions, rendering for us subversively what might be difficult to express directly. Mostly, it’s about creating a response, and causing the viewer to question their way of thinking. Which artists (or periods in Art History) have influenced your recent work? Who do you admire? MJB: I try to locate my work in Egypt’s contemporary history and in a Middle-Eastern, and Egyptian, art-historical past. 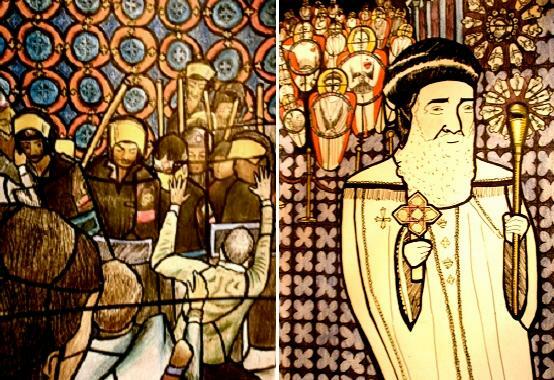 I have used government-distributed posters, paintings and photographs to influence my portraits, for example, as well as referring to a variety of historical works: ceramic painting from the Levant, Medieval Coptic painting and architecture and 15th and 16th century miniature paintings from the Timurid Empire are all sources that have influenced my work. You are also a writer, and are working on a graphic novel at the moment. What makes you pick one over the other? MJB: I love graphic novels, and have been greatly influenced by the works of Joe Sacco, Guy Delisle, Marjan Satrapi, Craig Thompson and Magdy el-Shafi’i. But there is something particular to the genre of the graphic novel that I haven’t quite understood yet. I’m still finding it difficult to adequately express my ideas with a sequence of images, certainly not nearly as expertly as these artists. My graphic novel will most likely be an illustrated story, with fewer, larger images. Something like Maira Kalman, hopefully. Writing is another kind of challenge. Without the physical image, words have to convey a similar imager, or imagery. It can be difficult to alternate between these different modes of expression, but probably enriching or something. I appreciate the challenge of writing, and a wider audience. But it’s a learning process. What projects would you like to be involved in in the future? MJB: As many large, public, collaborative projects as I can. I think in this period, it’s crucial to foster a supportive community, not only of artists, but viewers engaged and invested in self-expression. Artistic dialogue fosters collective dialogue. How do you envision the future of Cairo (and, if relevant, what do you hope for the role of art / artists / culture in response to crisis)? MJB: It is impossible to imagine the future of a city presently undergoing such dramatic transformation. For now, people are responding to a rapidly changing environment—politically, socially, economically, emotionally. Culture takes a back seat when there are the more immediate questions of safety and security. Egypt is currently under curfew, former President Mubarak may be released from prison, and death tolls continue to rise across the country. What I can only hope is that this period doesn’t undo the growth that Egypt has experienced culturally in the past few years, when art moved away from the academy, and the establishment, and stood with the people. I can only hope that self-expression continues to thrive as it has in the past few years, because I believe in its dramatic impact on the way people view themselves, and their society.